My fraud alarm has a hair trigger when it comes to self-aggrandizement and World War II. There were simply not that many Oskar Schindlers to go around—those who risked (and often lost ) their lives to help save those who had committed no crime except that of being a Jew. But there are some, to be sure. Yad Vashem calls them "Righteous Among the Nations" or "Righteous Gentiles." Yad Vashem (or the Holocaust Museum) in Jerusalem is the official Israeli entity that documents the events of WWII that led to the destruction of European Jewry. It was set up in 1953 with the approval of the Knesset, the parliament of the state of Israel.The origin of the name is a Biblical verse, Isaiah 56:5: "And to them will I give in my house and within my walls a memorial and a name (Yad Vashem) that shall not be cut off". Part of the museum is dedicated to the "Righteous Gentile." I am pleased to report on two such individuals—indeed, an entire town. The town is Campagna, about 30 km (20 miles) due east of the city of Salerno in the Picentine hills of the Cilento area. (The name of the town Campagna is not to be confused with the similar sounding "Campania," the name of the Italian region of which Naples is the capital city.) Campagna, the town, is about 5 miles north of Eboli. The town was the site of one of the concentration camps for Jews set up by Fascist Italy in WWII. The camp operated from 16 June 1940 to 8 September, 1943, the date on which Fascist Italy surrendered to the Allies. The criteria for the location of such camps were that the sites should be relatively isolated, not near ports, important roads, railway lines, airports or munitions factories. Campagna met those criteria and the prefect of Salerno proposed two monasteries in the town: the Convent of the Osservanti dell’Immacolata Concezione and the Dominican monastery of San Bartolomeo, both of which had already had some very non-clerical use in that they had been used as training facilities and barracks for officer candidates in the Italian army. San Bartolomeo was from the 1400s and on a steep slope of the Girolo hill in the valley of the Atri river. At the time the building had three floors and sufficient room for 450 persons plus guards. The Concezione was from the 1500s and was somewhat smaller than S. Bartolomeo. 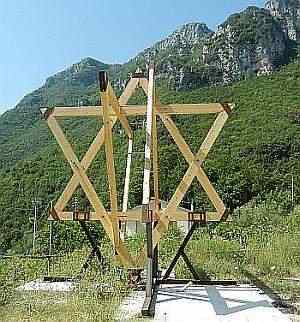 There have been a number of holocaust commemorations in Campagna this year involving the premises of both sites of the concentration camp. There is a memorial museum on the premises of San Bartolomeo, a permanent display called "Itinerary of Memory and Peace" with photos, documents about the site, related events and the Holocaust in general. The first internees were 430 men captured in different parts of Italy. Most of them were Jewish refugees from Germany, Austria, Poland, Czechoslovakia and Dalmatia, In the group there were also some British citizens and a group of 40 French and Italian Jews. Internees were allowed to receive food parcels, and none of the internees was killed, subjected to violence or deported to the infamous Nazi death camps in the north. Prisoners were allowed to organize a library, school, and theater. They could receive aid from DELASEM. * San Bartolomeo is immediately adjacent to normal residential buildings in what was (and still is) a small mountain town; prisoners were apparently at liberty to wander around and make friends with the populace and even accept hospitality such as meals. Two inmates died of illness in three years and were buried in the local cemetery with Jewish rites. There were two rabbis among the detainees. A number of the inmates were also doctors who provided medical attention. Inmates even had a soccer team that played against local amateur teams, and they had a camp bulletin. Also, a small synagogue was set up in San Bartolomeo. For a while, a pianist among the prisoners played the organ for Christian services on Sundays. Key figures in this story are Giovanni Palatucci, police chief of the northern Italian district of Fiume and his uncle Giuseppe Maria Palatucci, bishop of Campagna. Giovanni sent as many as he could to Campagna and in Fiume was so "sloppy" at his record-keeping that thousands of Jews in that northern center would have been sent to certain death had he not arranged for them to slip though the cracks. Various sources say that he saved about 5,000. He refused promotion and transfer as well as a safe-conduct pass to Switzerland when he was about to be found out. He paid with his life. He was arrested by the Gestapo and sent to Dachau where he perished at the age of 33. He is on the Yad Vashem list of Righteous Gentiles. During the last world war, this bishop of highest human and civil merit worked with heroic courage and civic virtue to provide moral and material aid to the Jews interned in Campagna, succeeding in saving around 1000 inmates from being deported to Nazi extermination camps. He was a brilliant example of coherence, human solidarity and moral strength based on the highest Christian values of sharing in the suffering of others. At San Bartolomeo a prisoners' room and the synagogue have been reconstructed. A film was made in 2008, directed by Salernitan documentary film-maker, Maria Giustina Laurenzi, called “Una storia diversa. Gli Ebrei a Campagna 1940-1943”. ["A Different Story. Jews at Campagna 1940-1943".] Also, there was a TV film by Fabrizio Costa (2001) entitled "Il rumore di un treno" (The Sound of a Train). It dealt with the life of Giovanni Palatucci and was broadcast by the Italian state television network. The population of Campagna, in spite of regulations, threats of punishment and reprisals, showed a high degree of solidarity and human brotherhood in choosing to alleviate suffering, give hospitality and at times aid the flight of Jews interned in the concentration camp in that town. It was a notable example of self-sacrifice and highest civic virtue. 1940-43. The Italian state also issued a citation to honor Giovanni Palatucci. As well, the Giovanni Palatucci committee and rabbi Shalom Bahbout (chief rabbi for Naples and southern Italy) have petitioned the Yad Vashem to recognize Campagna as a "City of the Just." *DELASEM is the acronym for Delegazione per l'Assistenza degli Emigranti Ebrei (Delegation for the Assistance of Jewish Emigrants), a Jewish organization set up in 1939 to facilitate emigration for Jewish refugees in Italy. The organization was authorized by the Fascist government and was legal until Sept. 8, 1943, when Fascist Italy surrendered to the Allies. At that point, with southern Italy in Allied hands, assistance became irrelevant at ex-camps in the south such as the one at Campagna. Antonimi (bibliography) says that "Despite limitations between 1939 and 1943, DELASEM succeeded in aiding more than 9,000 Jewish refugees and in helping 5,000 of them to leave Italy and reach neutral countries, primarily Spain." In the Italian territory still occupied by Germany and in the so-called Italian Social Republic (a remnant Italian Fascist state set up in the north), DELASEM was declared illegal but worked clandestinely through various agencies to continue providing help to Jewish internees. As a point of clarification, most of the Jews in all Italian camps were refugees from elsewhere in Europe; they were not Italian —hence the term "Assistance of Jewish Emigrants " in DELASEM; the goal of the organization was to help get those people out of Italy. As noted in this article , there were some Italian Jews in camps, including Campagna, but I have found no source —and I appreciate elucidation on this —as to how they were selected. To my knowledge, between the implementation of the so-called "racial laws" in 1938 and Fascist Italy's surrender in September of 1943, there was no mass movement in Italy, in general, to round up Italian Jews and herd them into camps; in Campagna, no refugee Jews were deported to the north. The racial laws for Italian Jews were draconian economically and socially, to be sure. The government forbade Jews from attending schools and universities, fired Jews from professorships, banned Jews from the civil service, military, and banking and insurance industries, and required Jewish owners of businesses to sell their assets to 'Aryans'; the government also confiscated Jewish bank accounts. The situation after September 1943 was dramatically worse. In the part of Italy that was still Fascist (everything from Rome north) there was a wide-spread cave-in to deport Jews, both refugees and Italian, to Nazi death camps . As a result, " ...Of the 45,000 [Italian] Jews counted in Mussolini’s census of 1938, about 8,000 died in Nazi camps. About 7,000 managed to flee. About 30,000 lived in hiding before being liberated by Allied troops" (cited in Vitello). —ANTONIMI , Sandro. (2000). DELASEM, Storia della più grande organizzazione ebraica di soccorso durante la seconda guerra mondiale (De Ferrari: Genova. — BETTINA, Elizabeth. (2009) It Happened in Italy: Untold Stories of How the People of Italy Defied the Horrors of the Holocaust. Nelson, Nashville. —CAPOGRECO, Carlo Spartaco. (2004). I campi del duce. L'internamento civile nell'Italia fascista, 1940-1943. Einaudi: Torino. — CORBISIERO, Fabio. (1999). "Storia e memoria dell'internamento ebraico durante la Seconda guerra mondiale. Il campo di concentramento di Campagna" (in Nord e Sud, n. 6, NIS: Napoli. — PERONO, Gianluca. (2001). Gli Ebrei a Campagna durante il secondo conflitto mondiale. Edizione Comitato Giovanni Palatucci. Campagna. — RAIMO, Goeffredo. (1992). A Dachau per amore. Giovanni Palatucci. Litotipografia Dragonetti, Montella. — VANZAN, Piersandro. (2008). Giovanni Palatucci, giusto fra le nazioni. Editrice Velar. — IZZO, Valentino. (2003). Raccontare Campagna... Il SS. Nome di Dio. — IZZO, Valentino. (2009). Antisemitismo - Palatucci - Campagna - Foibe (APCF), 2009. — VITELLO, Paul. (2010). "Scholars Reconsidering Italy’s Treatment of Jews in the Nazi Era" in the New York Times, November 4, 2010. My thanks to Laura Papallo for calling my attention to this.